We at Kleinfeld swoon over a great Love Story—two people fall in love, get engaged, shop for a dress, plan their wedding and tie the knot—but what happens when the bride-to-be is actually a former Kleinfeld intern? Well, let’s just say things happen a little differently. 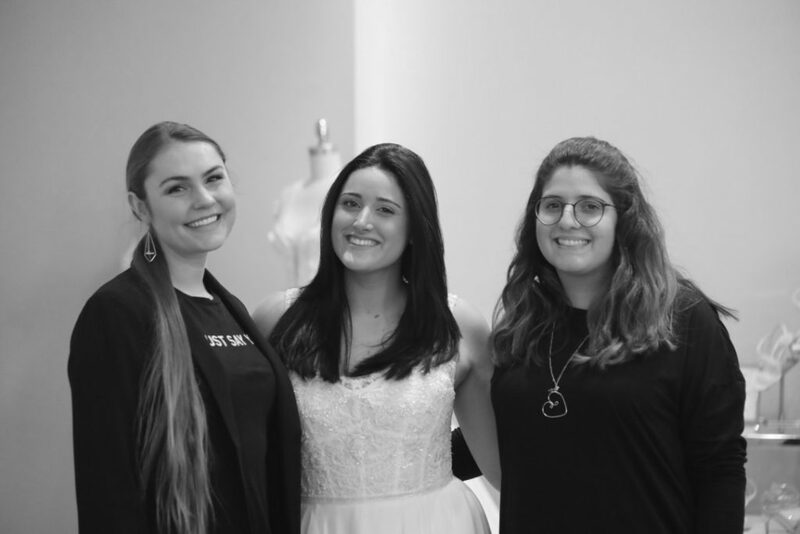 We sat down with one of our most beloved interns (and now Marketing Manager at Hitchswitch), Anabel, and heard all about how her shopping experience at Kleinfeld went, now that she’s on the other side of the business. Read all about it, below. Tell us about your fiancé and proposal. I was celebrating my 21st birthday by bar hopping around the city with some friends in attempt to recreate Epcot’s “drinking around the world”, dressed in Disney attire head to toe. Justin was doing the same, minus the Mickey ears, with my cousin Corey. We were first introduced that night! Justin proposed last March on the Diamond Beach in Iceland! It was a perfect, intimate proposal that I will always remember. We are getting married on October 18th of this year! It will be a romantic, rustic fall wedding at The Vineyards at Aquebogue. A Vineyard on the North Fork of Long Island. 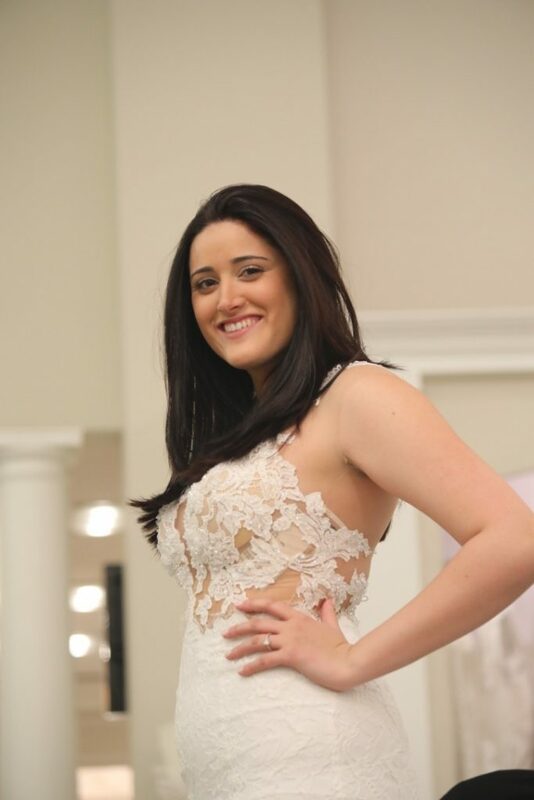 What was your experience like interning at Kleinfeld? Interning at Kleinfeld was an unforgettable experience. In those 4 short months, I completely fell in love with the wedding world! I worked closely with the Director of Marketing, Jennette who taught me all aspects of the wedding industry. I am forever grateful to Kleinfeld Bridal. They have brought me a lifetime of friendships and an amazing start to my career with one of their partners, HitchSwitch. 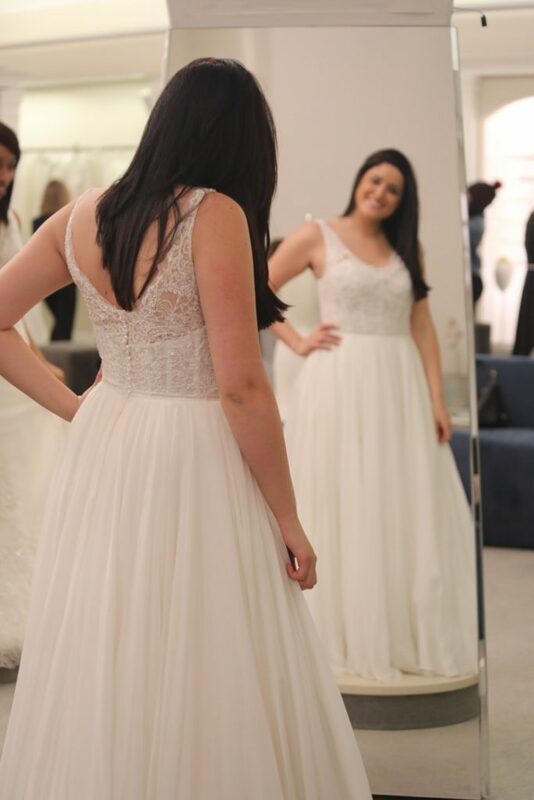 What did you enjoy most as an intern at Kleinfeld? One of my favorite parts of working at Kleinfeld was Bridal Market Week. I loved prepping for the runway shows and working with the models backstage. What do you do now at Hitchswitch? I am the Marketing Manager at HitchSwitch. I manage all social media platforms and develop and create relevant content for our followers. ICYMI, HitchSwitch is a one-stop-shop name change service for newlyweds. Hitchswitch takes the hassle out of figuring out which forms you’ll need, where to send them (and when) in order for you to easily and quickly change your name after your wedding. Plus, starting at just $29, it’s affordable for every couple! What emotions were you feeling before your bridal appointment? It was so exciting to be back at Kleinfeld, actually looking for MY wedding dress and being able to have my Kleinfeld family by my side. I was pretty nervous though before my bridal appointment. This is the real deal! Not just dress-up. We know you tried on wedding dresses when you were an intern—how was that different compared to your shopping appointment? This appointment was very different compared to trying on dresses when I was an intern. I actually never tried on a white wedding dress before my bridal appointment! When the interns played dress-up I only tried on blush gowns! It was really emotional when I first tried on a white dress. Do you have any advice for brides coming in to try on wedding dresses? Do your research! Have an idea of some styles you would like to try on. Trust your consultant and be open to trying on styles that they recommend. Only your opinion matters! It’s your day. Don’t let your nerves get to you. Have fun! You’re marrying your best friend! This should be as easy as saying “I do”. Tell us about your shopping experience! I wanted my appointment to be as intimate as possible. My mom and my Maid of Honor, Paige flew up from South Florida for my appointment. My consultant was Sarah, one of my very good friends who I met while working in PR & Marketing at Kleinfeld. It was a really private and special experience. Did you say yes? How did it feel? I did say yes to the dress! It was a really emotional moment for all of us. I knew MY wedding dress was somewhere at Kleinfeld but it was a crazy feeling actually finding it. Want to learn more about Hitchswitch? Read their FAQ. Looking to intern at Kleinfeld? Head to our careers page. Want to submit your Love Story? Here!